Lewis Hamilton has taken a dominant pole position at the end of a thrilling wet-dry qualifying session for the 2016 Austrian Grand Prix. The reigning world champion, who has never won in Austria, put in a last-gasp lap on a rapidly evolving track to qualify with a 0.5-second gap to teammate Nico Rosberg. “Really fun session,” said Hamilton. “Obviously sessions that start off dry [and] go wet — here it dries up incredibly quickly. It added to the excitement of the whole thing. Being a new surface as well it was very, very slippery. Rosberg set the fastest times in the first two practice sessions and appeared to be the favourite amongst the Silver Arrows drivers to set the fastest time of the afternoon, but a sudden shower at the end of Q2 put the German off his game. Compounding the loss of ground is that Rosberg will serve a five-place grid penalty — putting him in P7 — brought about by an unscheduled gearbox change after a suspension failure in free practice three pitched his car off the track. “Really unbelievable job from everybody — even Lewis’s mechanics came onto my car to get it out on time,” started Rosberg, thanking his team for repairing his car so quickly. “Very exciting qualifying, going dry–wet–dry. It was really unbelievable how quickly it dried at the end. Lewis did a good job there at the very end. The finale of Q3 was a thrilling all-in duel as the track dried after the Q2 rain, and Nico Hülkenberg threatened to steal the show after provisionally holding pole part of the way through Q3. His Force India, not for the first time this season, hit its stride with its class-leading Mercedes power unit, ultimately putting him third-fastest of the session. 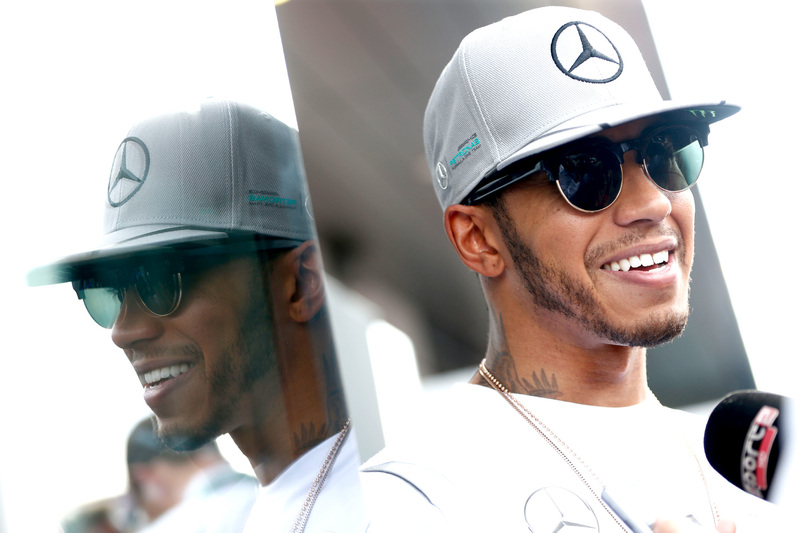 “It reminded me a lot of Brazil,” said Hamilton, recalling his maiden pole position at the 2010 Brazilian Grand Prix. “I was feeling really good in the car, it was a flashback to back then. “To be honest I was expecting a little bit better, [but] I wasn’t disappointed. Sebastian Vettel was 1.859 seconds off the pace in fourth, but he too will serve a five-place penalty for a gearbox change, demoting him to P9. Rosberg and Vettel’s penalties move McLaren’s Jenson Button, outstanding in P5, illustrating his mastery of changeable conditions, to third on the grid in what is easily McLaren-Honda best qualifying result in the modern era. Kimi Räikkönen was sixth fastest with a time one-tenth of a second behind his teammate and less than that ahead of Red Bull Racing’s Daniel Ricciardo. Valtteri Bottas and Felipe Massa’s eighth and tenth fastest times were massively disappointing for Williams, which two years ago locked out the front row in Austria and last year qualified as high as fourth. Between the white cars qualified Max Verstappen with the ninth-fastest time, but the Dutchman will move up a place to make way for the demoted Sebastian Vettel. The teams’ radars predicted rain, resulting in a dash from all remaining competitors — Carlos Sainz’s power unit failure and Sergio Perez’s suspension failure, both sustained in Q1, prevented them from taking part — onto the track. The ultrasoft tyre was the rubber of choice for all bar the Ferraris, which attempted to make it through to Q3 on the supersoft tyres and thus start their races on the more durable compound. Sebastian Vettel was successful, but Kimi Räikkönen couldn’t string together a quick lap and reverted to the purple-coloured ultrasofts. Seeing a potentially successful gambit unfold before them, Red Bull Racing’s strategists put Daniel Ricciardo and Max Verstappen on the softs, and both set their fastest laps on the tyre. Mercedes, beginning to feel nervous, did the same — but neither Lewis Hamilton nor Nico Rosberg could better the times set with the ultrasoft tyres, and the arrival of the rain prevented them from trying again. Esteban Gutierrez was the highest-ranked driver to miss out, qualifying eleventh and just 0.006 seconds off Jenson Button’s P10 time. Pascal Wehrlein, after setting a sensational Q1 lap to make it into the top 16, put his into twelfth, ahead of Haas’s Romain Grosjean and McLaren’s Jenson Button. Carlos Sainz was classified fifteenth, and of Sergio Perez in sixteenth. The ultrasoft was the immediate tyre of choice for all teams at the warm beginning of an afternoon session that immediately facilitated extremely close lap times through to the bottom of the time sheet. Nico Rosberg’s participation was briefly unknown after his car suffered a dramatic suspension failure during free practice three two hours earlier, but his mechanics managed to repair the car and send their driver out with a little over nine minutes remaining. The German’s first flying lap put him fastest, 0.25 seconds faster than teammate Hamilton, and his second attempt opened the gap to almost half a second, with Vettel splitting the difference between them. With less than two minutes to go the top 10 were separated by about a second, including Pascal Wehrlein in a sensational ninth, but just as the session was building towards a thrilling climax Daniil Kvyat heavily crashed his Toro Rosso. A catastrophic rear suspension failure sent his car careering across the gravel and into the barriers, apparently after the Russian’s car ran wide and onto the new-for-2016 ‘baguette’ kerbs, which are designed to deter drivers from abusing track limits. It was the third such crash of the weekend after Rosberg’s practice crash and a breakage on Sergio Perez’s Force India earlier in the session. Lewis Hamilton was asked about the unravelling situation after the session and expressed his own concern about the kerbs. “We’ve now seen a couple of incidents; I don’t know how many of those it’s going to take before a car ends up in the wall and someone gets hurt. The session was red flagged with 1 minute 44 seconds remaining, and after a delay to clean the debris the session was restarted — but the bottom six never had a chance to improve when Carlos Sainz’s Toro Rosso suffered a power unit failure, prompting yellow flags and neutralising the track. Kevin Magnussen was eliminated in P17 with a 0.02-second buffer to Renault teammate Jolyon Palmer. Rio Haryanto could only manage P19, ahead of the crashed Kvyat, while Sauber duo Marcus Ericsson and Felipe Nasr qualified slowest of all in P21 and P22.